At Buckeye Veterinary Services, you can expect state-of-the-art medical care for your four-legged companions. We believe in nurturing the human-animal bond and creating a harmonious relationship between people and animals. You can expect to be greeted by a courteous receptionist, clean exam rooms, friendly doctors, and caring technicians. We appreciate the role we get to play in your pets' health care. If you have any questions or comments about how we can care for your pet, please contact us today at (623) 386-2532. We've been taking our pups to this location for a few years and have never had an issue getting an appointment. The staff is very friendly and caring which I appreciate. Their prices are very reasonable! I've been going to Dr. Ryan for years. She truly cares about every animal that walks thru her office doors like they are her own. All of my dogs have lived to old ages. Dr. Ryan was always there for us thru their senior years and also supportive when it was time to help them pass on peacefully. I grew up in Buckeye and even though I moved to Surprise, I still drive out to Buckeye to take my dogs to her. I'm forever grateful for her professional advice and support for each pet I have brought to her. I highly recommend Dr. Ryan for any of your pet needs as she makes your pet a priority. Dr. Helen Ryan and the rest of her staff care for our animals. They truly care what happens, I have the upmost respect for Dr. Ryan. She even cares for the owners. I've been going there for 4yrs now. Bless them! They have always taken good care of my animals. They treat them with lots of TLC. My animals have lived a long healthy life due to the excellent care and advice. 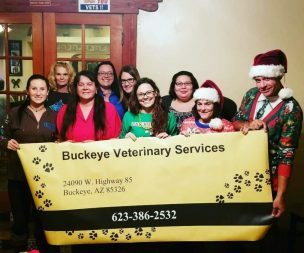 Thank you to everyone at the Buckeye Veterinary Service.